Happy Thursday!! 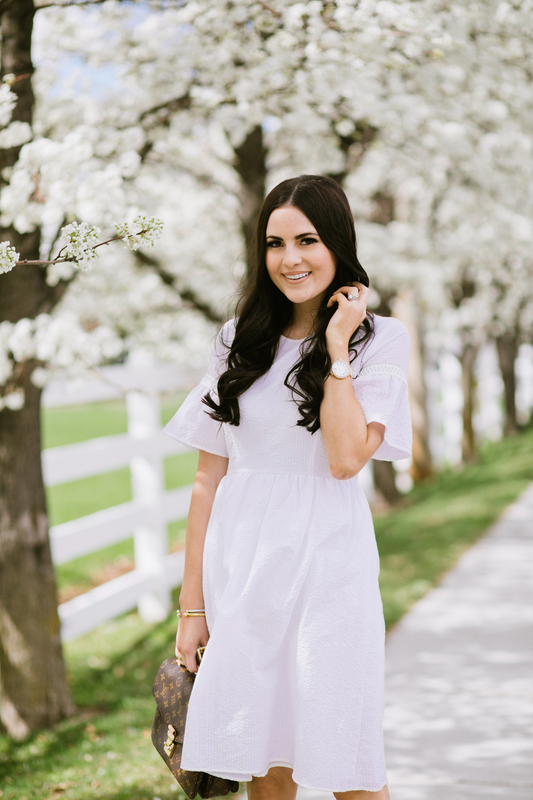 Who doesn’t love a little white dress?! I love the fit and flare style this one that just launched last week from my clothing line. 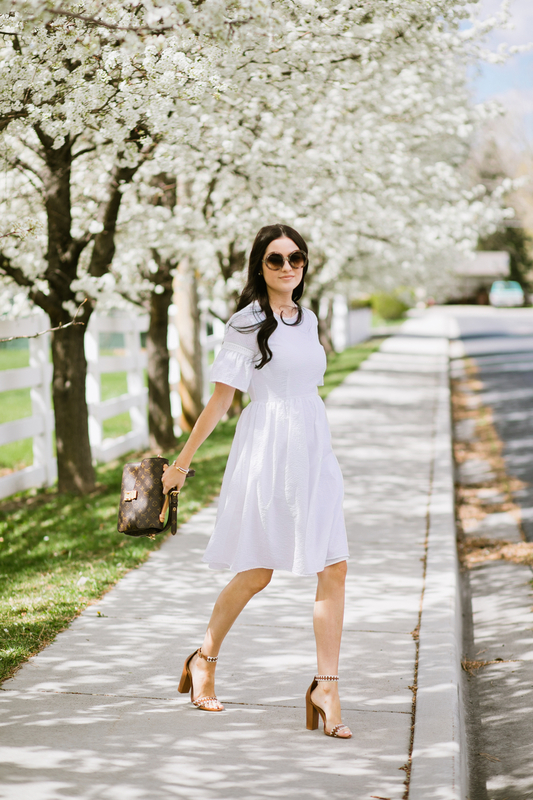 It’s the perfect, flirty dress for spring (and summer)! That’s a lovely dress! So beautiful! this dress is so cute on you, and I love those shoes! How cute is that white dress! I love it and those sandals are darling with it! I really love this dress, especially the sleeves! Such a fun style for spring and summer. What a pretty dress! I love the sleeves and how the flare out a bit, such a cute flirty detail. Thanks for sharing, you look absolutely beautiful! I hope you’re having a great day so far! This is really gorgeous. I love the all white looks with white flowers on the background. Your content is always captivating. Did you use a photographer here or family members? 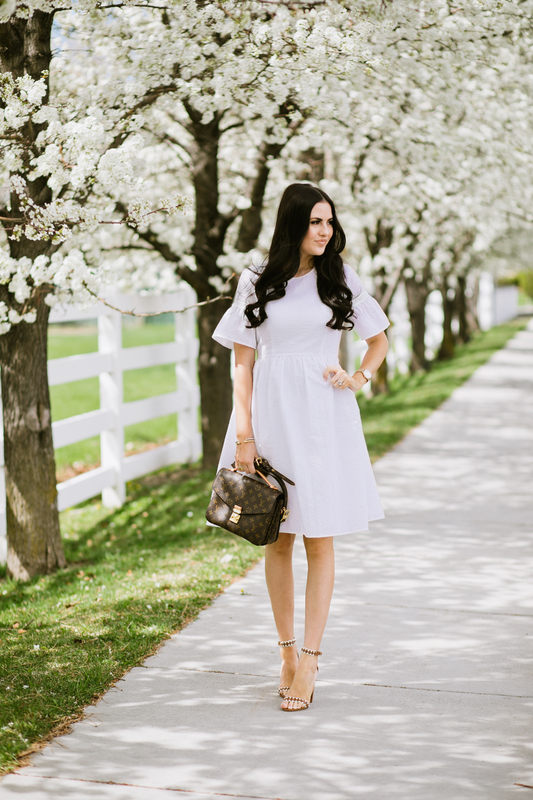 From the dress to the shoes and that gorgeous backdrop…LOVE this look! You look so beautiful, the dress is stunning! Great post! Oh, you are so sweet!! I’m glad you like the collection and I’m sure you will look absolutely stunning in the lace dress! Such a cute look – love the sandals! And that street looks gorgeous! Such a perfect outfit for the summer! Love the way those shoes just pop on camera! The photos are so washed out we can’t even see the details of the dress! Such a shame. I love this dress!!! I have been searching for something like it for my baby shower- do you think this would accommodate a bump ok? :) Its beautiful! Ya I think it would be super cute with a baby bump!! You can have so much fun with LWD! This one looks retro inspired to me! Love the way you styled it with LV bag and cute sandals! Is this dress available for purchase anywhere?